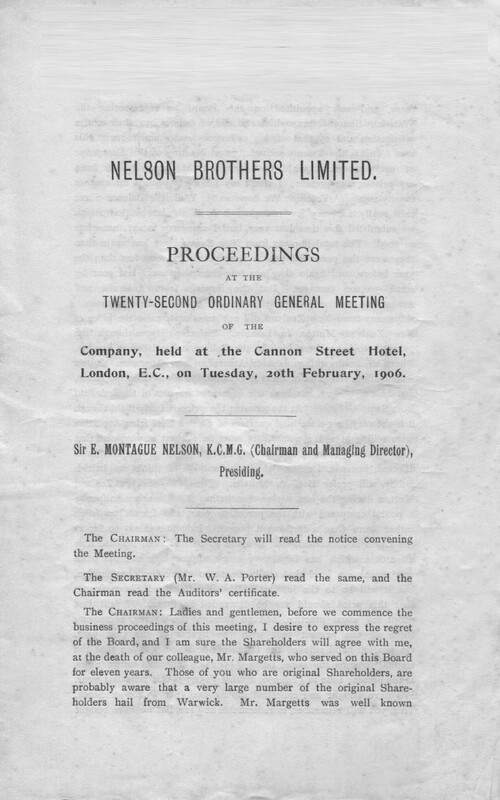 Company, held at the Cannon Street Hotel, London, E.C., on Tuesday, 20th February, 1906. 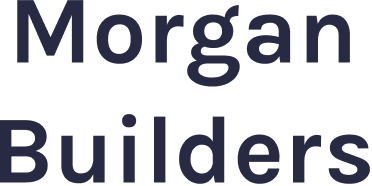 Sir E. MONTAGUE NELSON, K.C.M.G. (Chairman and Managing Director), Presiding. The CHAIRMAN: The Secretary will read the notice convening the Meeting. The SECRETARY (Mr. W. A. Porter) read the same, and the Chairman read the Auditors’ certificate. The CHAIRMAN: Would any Shareholder like to ask any questions? 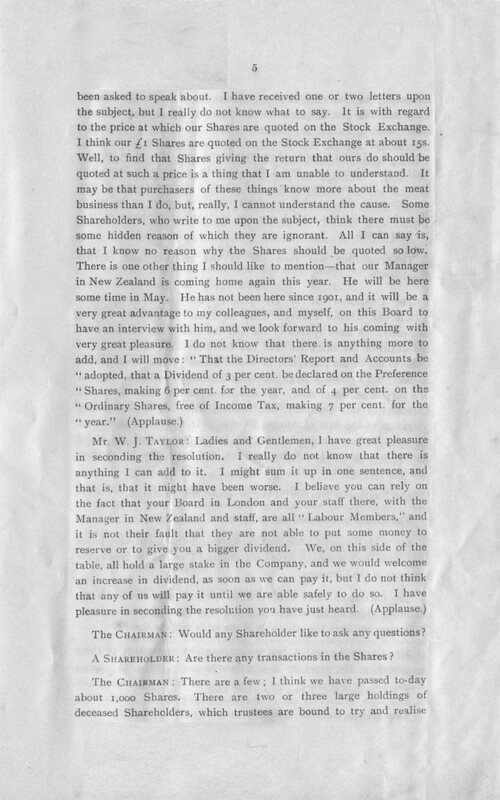 A SHAREHOLDER: Are there any transactions in the Shares ? as speedily as they can; that might have an effect on the market. They are not forcing them on the market, but it may make a difference. 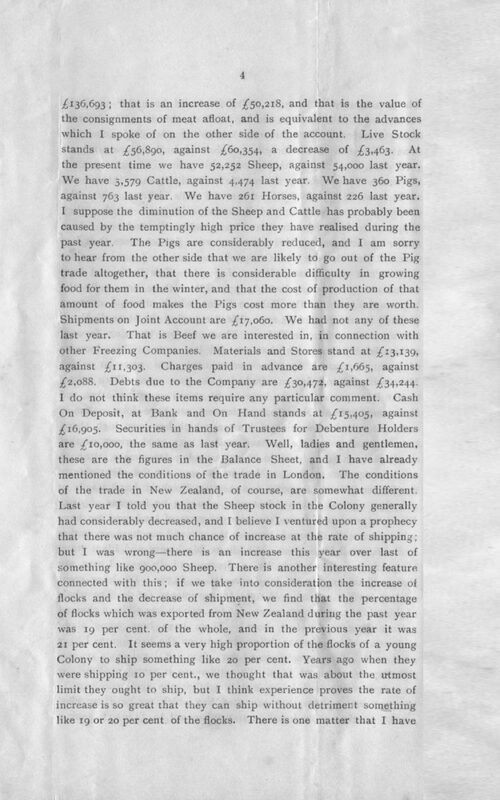 Mr. E. H. WILKINSON: You mentioned that the price of the Shares was about 15s., but I ﬁnd that in yesterday’s Times the ﬁgure of 16s. was mentioned, and about a fortnight ago it was 16s. 6d. – 16s. 9d., so that we don’t want the ﬁgures to be worse than they really are. All I can say is, that these Shares at 16s. are very cheap. The resolution was then put to the meeting, and carried unanimously. 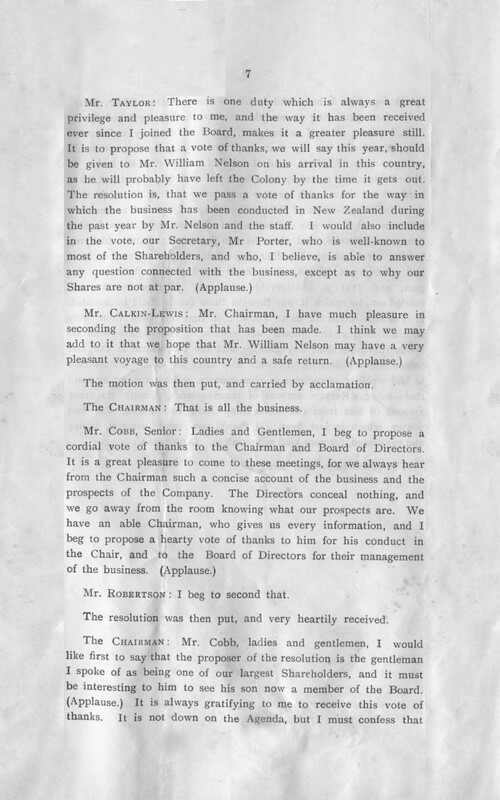 The CHAIRMAN: It is my pleasing duty now to propose “That Mr. Rhodes Hawtyn Cobb be elected a Director of the Company.” I have spoken of the loss the Board has sustained by the death of Mr. Margetts, and the Directors have appointed Mr. Cobb to act in his place, and he comes before you for conﬁrmation to-day. Mr. Cobb is a large Shareholder himself, and he is the son of a very large Shareholder. He was also a partner of one of the ﬁrst Directors of this Company, Mr. Anning, who died a good many years ago, of the ﬁrm of Anning & Cobb. Mr. Cobb is a gentleman we know to be capable of giving his best attention and his useful knowledge connected with this business, and I am sure his services will be very valuable to this Company. Mr. FREDERICK NELSON: I beg to second that resolution. 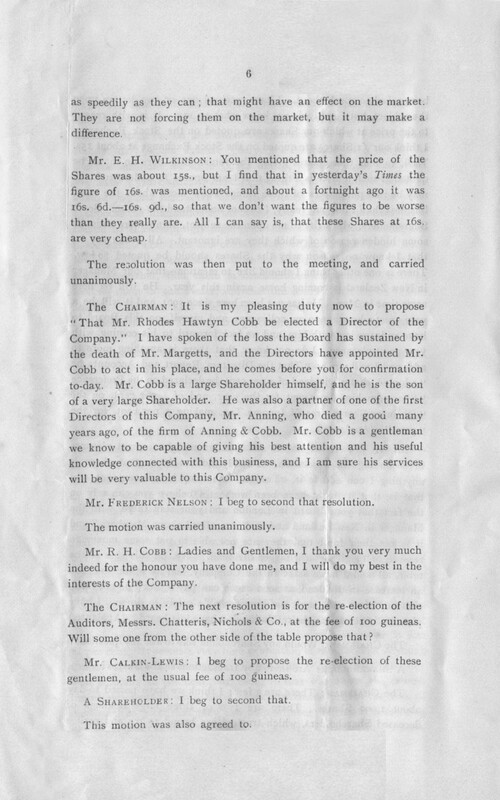 Mr. R. H. COBB: Ladies and Gentlemen, I thank you very much indeed for the honour you have done me, and I will do my best in the interests of the Company. 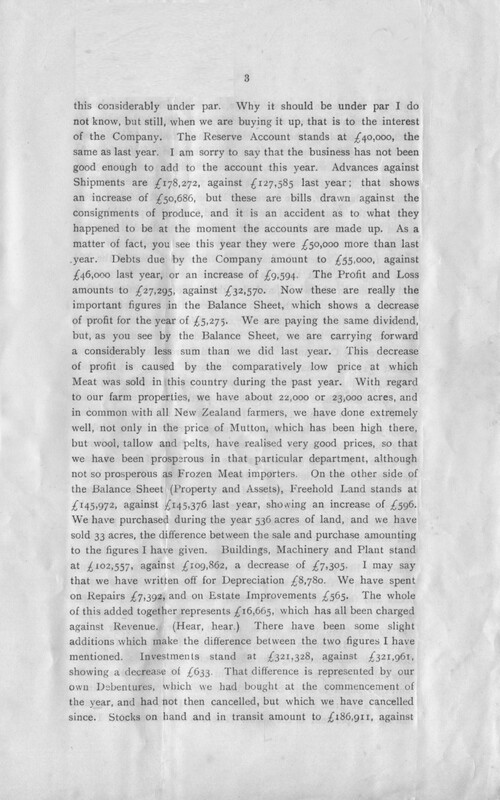 The CHAIRMAN: The next resolution is for the re-election of the Auditors, Messrs. Chatteris, Nichols & Co., at the fee of 100 guineas. Will some one from the other side of the table propose that? Mr. CALKIN-LEWIS: I beg to propose the re-election of these gentlemen, at the usual fee of 100 guineas. A SHAREHOLDERS I beg to second that. This motion was also agreed to. The motion was then put, and carried by acclamation. The CHAIRMAN: That is all the business. Mr. ROBERTSON: I beg to second that. The resolution was then put, and very heartily received. I look for it as I have had it for so many years. (Hear, hear.) It has been gratifying to me also to have had the vote of thanks in bad years, as well as in good. 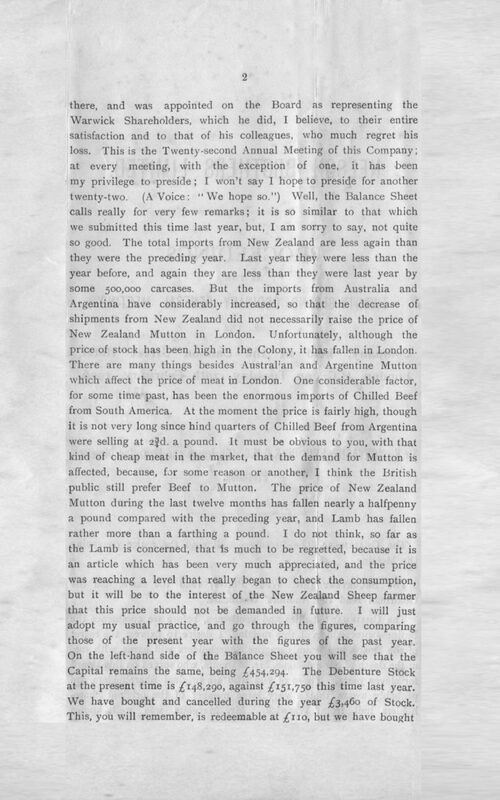 It has been my unfortunate duty, sometimes, to say that we were very sorry that we could not pay any dividend, and I should think that no body of Shareholders, and certainly none with whom I am acquainted, have borne these times with greater patience and less dissatisfaction, than the Shareholders of Nelson Brothers. I omitted to mention just now, when I was talking about farming operations having been so successful, that there is one interesting thing which my brother wrote about the other day – that this past year, we have had a very wet winter. You have heard about ﬂoods in the past, and that a considerable amount of river work was carried out, by which it was thought these ﬂoods could be avoided. It is a satisfaction for us to know that that has been thoroughly effectual during the recent wet season. There have been no ﬂoods that have done any damage, and the only harm is the late season and the shearing delayed. But after all, we are accustomed to bad weather sometimes in this country, and we can understand there being a certain amount of inconvenience, though no great amount of loss from the rains they have had during the last winter, which is just over. I thank you most heartily, ladies and gentlemen, for your kind appreciation. (Applause) .